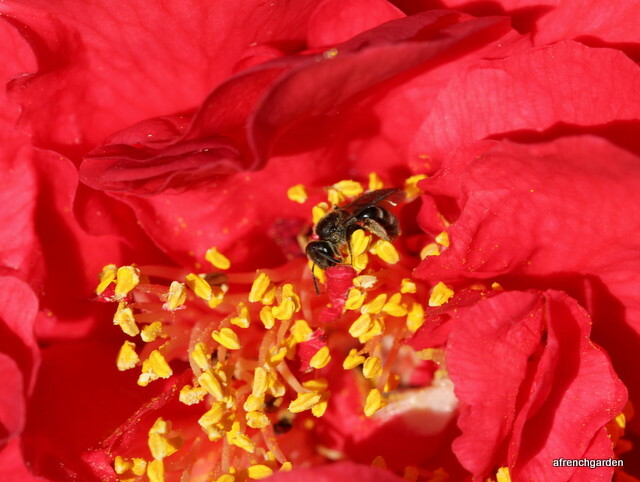 We plant flowers that all the bees like – not just the honey bees. It is not too difficult finding the flowers for us and the bees. I love Wisteria and it was good to see that a female blackbird has chosen the Wisteria growing on the wall of our outbuilding to make a nest. Some accommodation is specially made and it is not only this Anthophora that has made use of this bee house. The Barn Owls have taken to their adapted trunk high up in the outhouse. Some accommodation, like the window shutter, is improvised and is a home for the Barbastelle bat. Of course, good accommodation includes bathing facilities, much appreciated by the Redstarts. However, when a swallow chose our living room it received a resounding shout of “Out!”, and the doors were firmly kept closed until it had chosen another nest site. Categories: Nature | Tags: Anthophora, Barbastelle bat, blackbirds nesting, Bombus pratorum, Redstarts, swallow | Permalink. Sadly our annual bat visitor left us two days ago. It was sad to look and find an empty space behind the shutter. I checked the shutter on the other side of the French door but I knew he did not like that side. No bat on the wall or on the shutters. Then it occurred to me that it had started to rain two days ago. So Kourosh was duly dispatched to the atelier with a torch because if anyone could find a needle in a haystack it would be him. So, not very far away from where he had roosted last year, our bat had remember that there was a good place to shelter in inclement weather. It does mean that the photographs are not so good as he is quite high up and the angle of the photograph is directly underneath him. I’m glad he has not left us yet. The weather is forecast to improve next week. Categories: Nature | Tags: Barbastella barbastellus, Barbastelle bat, gardening, wildlife | Permalink. What a ridiculous question! It is a well known fact that bats like hanging about in dark places like belfries or caves. In fact, our bat gave up his usual place behind the front door shutter last year to hang in the atelier when it was very wet. So I was surprised yesterday, as I was enjoying sunshine and temperatures in the lower 20’s, that the bat looked as if it was doing the same thing! Bats in France often find shelter in old quarries or disused railway tunnels so perhaps, after a winter of hanging about in places like that, a nice bit of sunshine on the back of your neck feels really good. He often moves up and down the wall behind the shutter during the day but he had moved half-way out from behind the shutter, and because the sun was shining in from the side, his whole body was in the sunshine. He must have been very hot because I could not have sat out in the sunshine in a black fur coat! So perhaps sunbathing bats are more common than we think. Categories: Nature | Tags: Barbastella barbastellus, Barbastelle bat, French life, garden | Permalink. After two weeks of holidays we were happy to see the garden again but it was at a slow, measured pace we gave the garden its customary “so good to see you” check over. We have returned with a ‘flu the like of which we have not suffered from in many a year. Even the dandelion clocks in the grass look good. There is more red dead nettle (Lamium purpureum) than grass but that suits the Anthophora and bumble bees. The Anthophora fly very quickly but look very similar to fluffy grey bumble bees – only there are no grey bumble bees (in France, anyway). The Hyacinths where we sit at the front of the house smell delicious, overcoming our poor sense of smell at the moment and kindling the hope that soon all will return to normal. 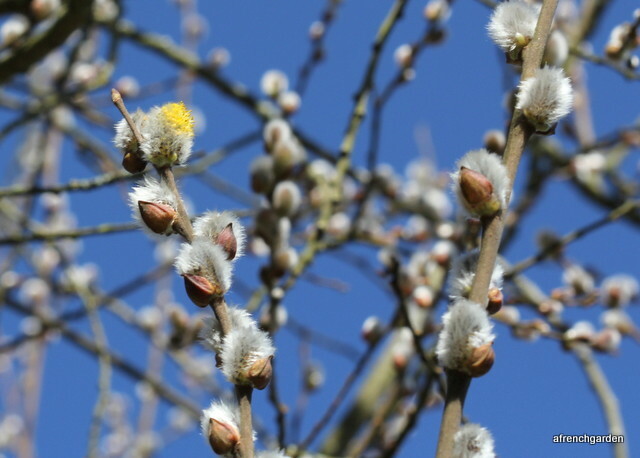 We have missed the main pollen fest from the big willow (Salix caprea) at the bottom of the garden. All kinds of bees are still visiting the tree. There seems to be plenty to satisfy the needs of all comers. The Hellebores have done well this year and are constantly visited by the bees. In the vegetable garden the broad beans are doing well and are very attractive to all sorts of solitary bees. I wish I could have stayed looking longer as I saw these two almost immediately. Certainly the wild bees are wherever you look. 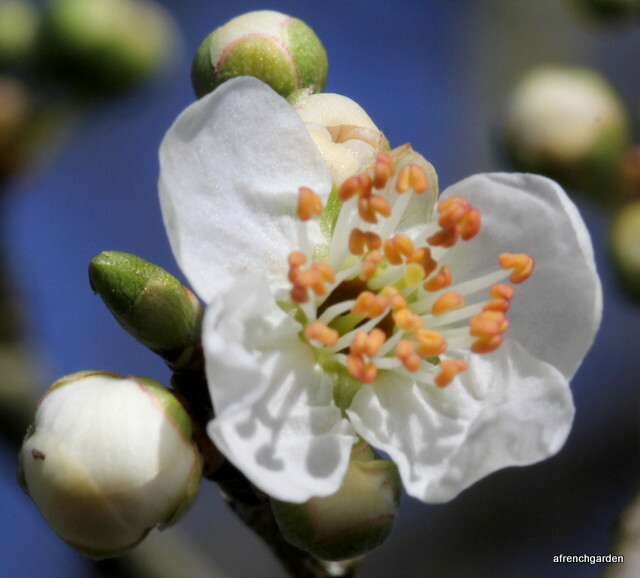 Our apricot trees are flowering and I am sure will be well pollinated but whether the weather will allow us to have apricots this year remains to be seen. Temperatures of 21 degrees yesterday and 23 degrees today are warm for this time of year and we can have frosts up until May. But the one thing that lifted our spirits was to find “our” Barbastelle bat was waiting for us on our return. He had taken up his usual position behind our living room shutters. He is only little, I would estimate about six centimetres from the back of his body to the tip of his head. He has been visiting us annually for about four years now and we look forward to his visits, see “Many Happy Returns” for last year’s visit. I find him very attractive and he does not seem to mind me taking photographs although I try to be as rapid as possible as it does disturb his beauty sleep. Categories: Nature | Tags: Barbastelle bat, gardening, Salix caprea, solitary bees | Permalink. I suppose we should have realised from the time of year that we could be receiving a visit from our friendly Barbastelle bat (see https://afrenchgarden.wordpress.com/2015/03/06/many-happy-returns/ and https://afrenchgarden.wordpress.com/2014/02/21/a-furry-visitor/). 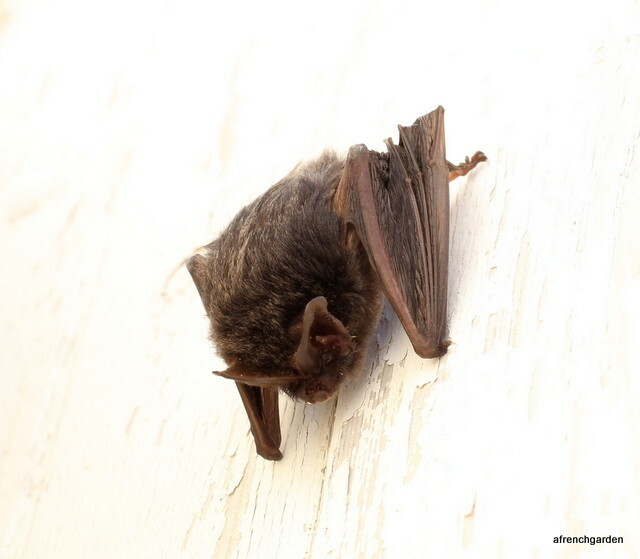 We have been looking around the front shutters but when Kourosh went out to collect some logs from the outbuilding the other day he felt a bat fly around his head and he noticed where it settled. The bat is quite small with a body about six centimetres long so I have marked the spot where he roosted on the wall at the corner of the joists as that is not visible from the closer photograph. We are not sure whether it is the same bat that comes every year but in view of all the rain we have been having this looks like a much better choice of roost. It looked very cosy between the outside wall and a supporting bean of the mezzanine deck. Much drier than behind a shutter! 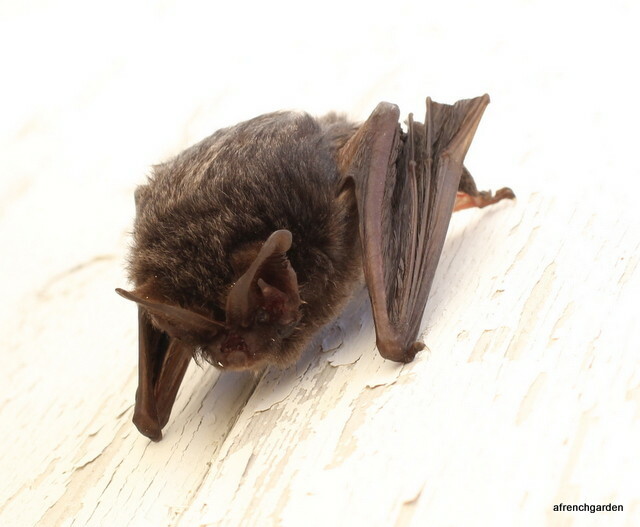 However, I note from the book “Le Guide des Chauve-souris en Poitou-Charentes” by Olivier Prévost (2004) that small colonies have been found behind the shutters of abandoned houses. Another place that they use frequently is the lintel space on doors of barns. France is fortunate to have representants of thirty one of the forty one European species of bats. The Barbastelle is a threatened species if viewed on a European basis but not rare in this area. However, they have a tendency to move around and shift their roosts depending on weather conditions so they are not easy for researchers to keep an eye on. They are also found sheltering in the abandoned quarries of Poitou-Charente. It eats mainly moths of the type that would be found flying in dry leaves and litchens in wooded areas and its natural roosting spot can be presumed to be cracks in trees. So the Barbastelle (Barbastella barbastellus) is not just a pretty face but an important link in the health of the European forests. Categories: Wildlife | Tags: Barbastella barbastellus, Barbastelle bat, Charente Maritime, French life, nature | Permalink. 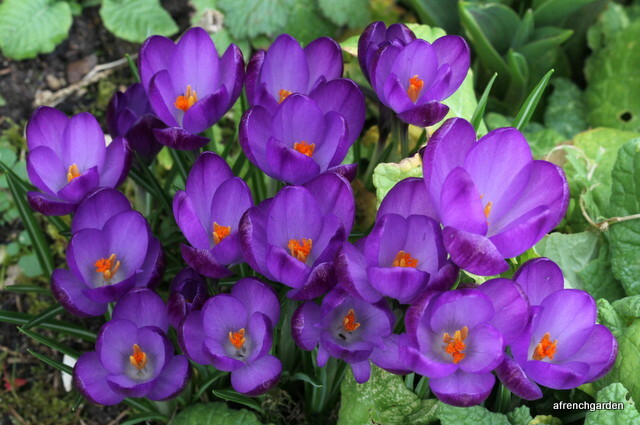 All it takes is a little bit of sunshine and splashes of colour return to the garden. After all the rain the plants are ready for the big opening. There is not much pollen on the willow yet, these stamens were the only ones I saw and they were high up, but it won’t be long. I saw my first blossom on the big plum tree in the garden. In warm years so many bees come to the plum tree when it is in flower that I can hear the buzz from about 100 metres away. 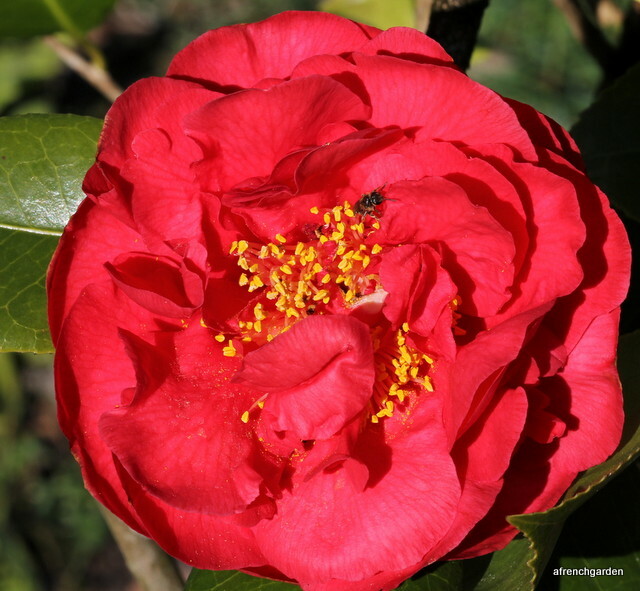 The red Camellia provides more than colour. The thick layer of petals has been providing a comfortable B&B for this little halictes bee. 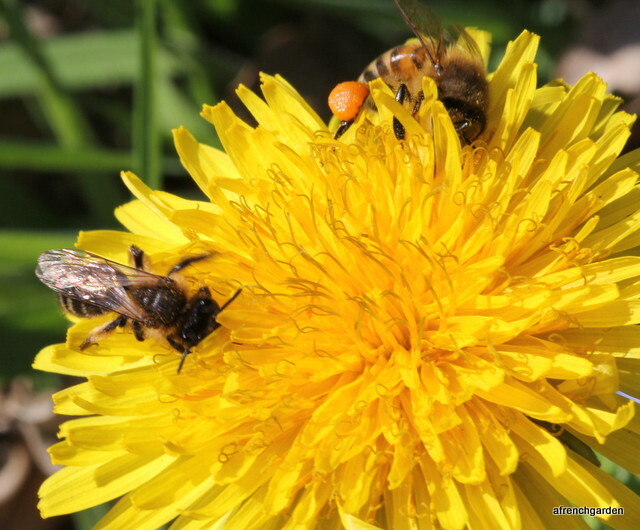 The dandelions are out and this one is being shared by a honey bee and a solitary Andrena bee. I look forward to the return of the bees and butterflies in the garden. One returning visitor came as a surprise. My husband spotted him at the end of February and he is still with us. He is a Barbastelle bat (Barbastella barbastellus). Barbastelle bats often pass the winter in underground caves or cavities. As he has decided to take up residence behind our living room shutter again I would presume he is starting to get active. Once again I presume that if I have been seeing butterflies during the day he will be finding moths (to which he is partial) during the night. I can keep an eye on him during the day by looking in sideways without disturbing him and I have noticed that he changes position between roosting on the wooden shutter and the stone wall of the house. This means that it is the third year that we have noticed a Barbastelle bat in exactly the same place (see last year “A furry visitor”). They have been known to live for 23 years so it seems likely that it is the same individual. 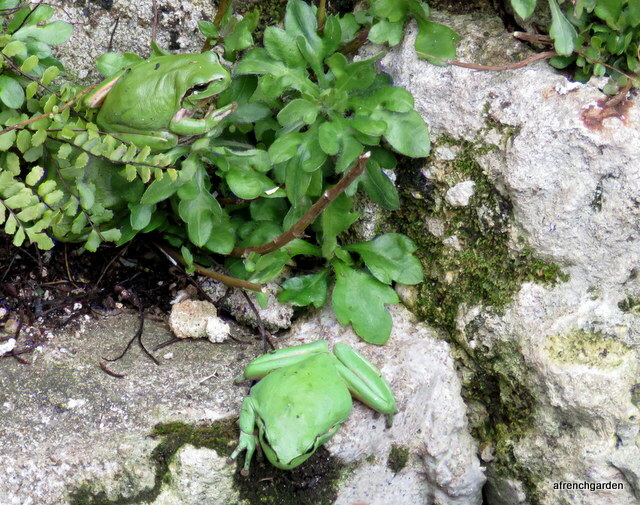 The warm damp weather is ideal for the green tree frogs ( Hyla meridionalis). They have returned to bask in the sunshine in front of the dining room window. Often we hear them before we see them and they are difficult to see until one of them moves, as you can see on the picture above. This is my favourite time of year in the garden as everything makes its first appearance. Categories: Garden | Tags: Barbastelle bat, bees, Charente Maritime, garden, gardening, Hyla meridionalis, nature, tree frog | Permalink.